BEFORE: Good week? Big week! Dredd is the third advanced screening this week and is the film du jour. This film actually doesn’t seem that appealing based on the trailer, but it held a 100% rating on Rotten Tomatoes for a while and is currently in the 90% range. Apparently people are liking it, so I can’t wait to see what all the hype is about. AFTER: Dredd is a great example of how I differentiate great entertainment from a great film. 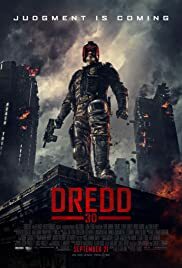 Dredd is a very entertaining film in that it would be hard to find a better way to spend 95 minutes. However, it’s not of the same quality entertainment that, say, Argo was. This was a 3D screening. My thoughts on 3D can be very mixed; sometimes its good and sometimes its not. Overall, the 3D was done very well in Dredd with occasional uses of “bad” 3D (read: stuff pops out from the screen). If you do see the film in 3D, you won’t be disappointed. The question is, should you spend the extra money in the first place? In this case, I feel the 3D aspect adds a certain quality to the film, especially in the slow motion scenes. But onto the film. Little did I know, Dredd is actually based on the Judge Dredd character from the 2000 AD comic and there was an 1995 film, Judge Dredd, that stared Sylvester Stallone. Since I haven’t read the comics or seen the 1995 film, I can’t comment to how good the adaptation was. I can, and will, be talking about how great a standalone film it is. One reason I like this film is that I see it as a modern Die Hard. Everything takes place in one location (Peach Trees) and revolves around one, or in this case two, people attempting to stop the villains. Obviously there are many differences between the two: the futuristic setting, lots of background detail, and less MacGyvering than John McClane was forced to do. Something I was very surprised about was the acting. There is a major obstacle for Judge Dredd (Karl Urban) with his performance; the only visible portion of his face is his mouth. That means no view of the eyes, or what is known as the window into the soul. And yet, Urban gives one of the best performances of the film. Not to knock the performances of Olivia Thirlby or Lena Headey, who also did an extraordinary job, but Urban really amazed me. Dredd has a lot of gore. A LOT of gore. Personally, I thought it was very well done even though it was a bit extravagant. The last time I saw this much gore, did I mention there was a lot, was Kill Bill: Volume 1. I didn’t like the gore in Kill Bill because it was too unrealistic. In Dredd the gore is very exaggerated yet still realistic. So yeah, I thoroughly enjoyed Dredd and recommend you see it, and in 3D. Unless of course you get squeamish easily, in which case, Trouble with the Curve might be a more suitable option for you to see in theaters next weekend. Dredd opens in theaters on September 21.